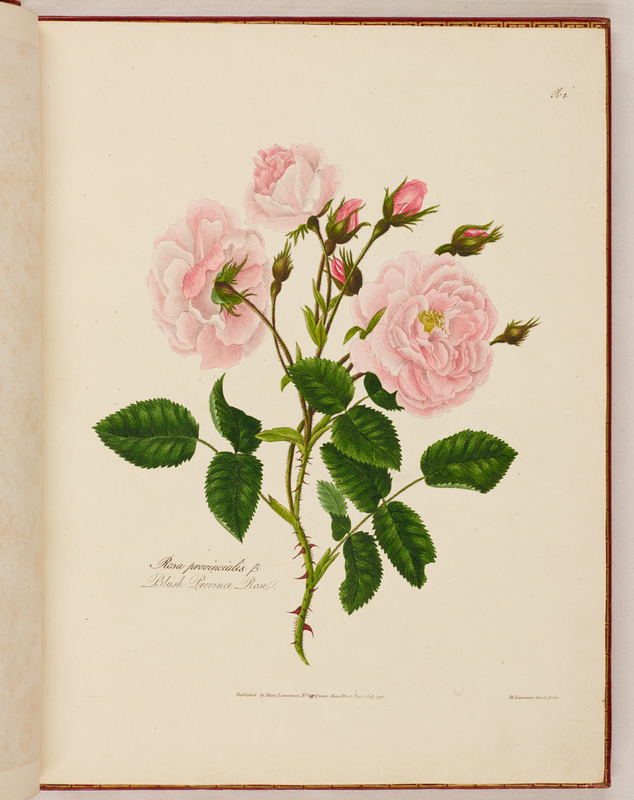 A collection of roses from nature was the first book to be wholly devoted to roses, predating Pierre Redouté’s more famous book by nearly 20 years. 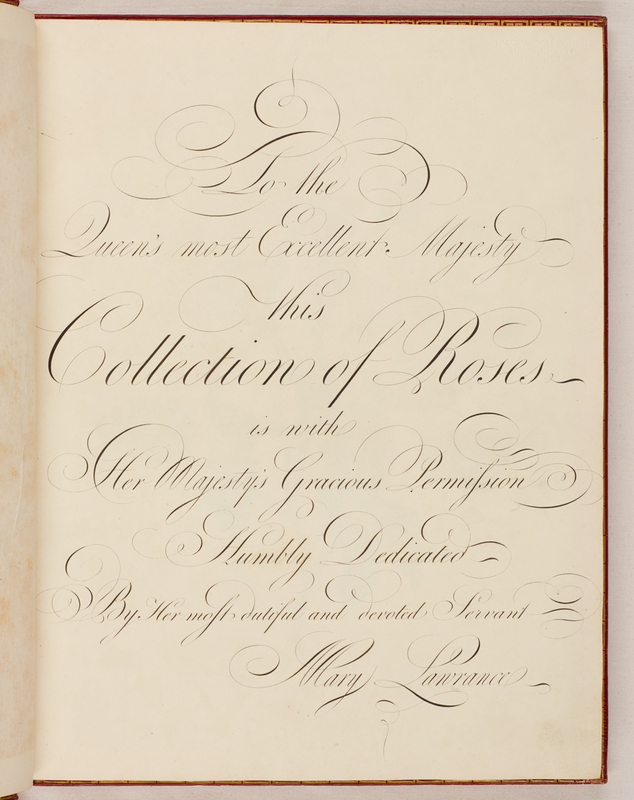 Redoute’s book has tended to eclipse Mary Lawrance’s, with later critics damning her with faint praise. However Mary Lawrance’s book was much more unusual, being entirely her own work, from the painting to the etching, from the printing to the colouring, as well as the publishing. Redoute’s book in comparison was the work of a team- he was the painter, whose images were transferred to print by others. 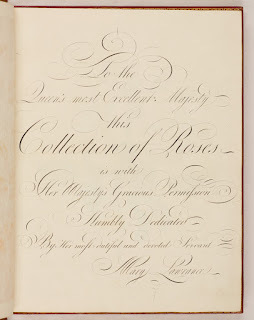 One look at her opening frontispiece shows us a vibrant and highly finished work of art. The etched outlines are lightly done, with the complex hand-colouring providing the light and shade, variety of hue and tone. Little has been known about Mary Lawrance until now. Research using the Library’s subscription to the Ancestry database provides the information through census data and her will that she was born in 1776 in London, and died there in 1845. This would make her aged 20 when she began her roses book. At the time this was a very unusual activity for a young woman to undertake on her own. She described herself on the title page as a teacher of botanical art and dedicated her book to Queen Charlotte, wife of George III, something that required the Queen’s permission. 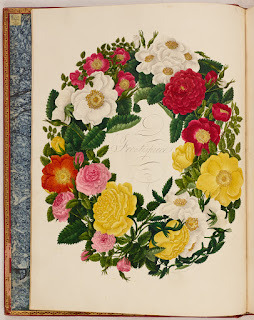 She only ever produced one more book like this, A collection of passion flowers, 1799-1802. However she exhibited paintings of flowers annually at the Royal Academy from 1794 until 1830. After her marriage to Thomas Kearse in 1813 she was known as Mrs Kearse, but continued to work as an artist. 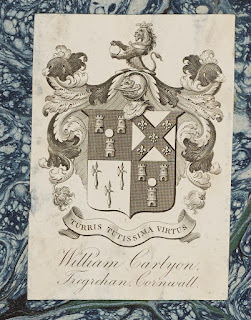 The Library’s copy has the bookplate of its early owner, William Carlyon of Tregrehan, pasted to its inside cover. Tregrehan is a country house in Cornwall, still known for its gardens. When the book came to New Zealand is not known, but it is presumed to have come with Major George Gwavas Carlyon who emigrated to New Zealand in 1856 and established the Gwavas station in the Hawkes Bay. The Gwavas Garden continues the family association with botany and gardening, something Mary Lawrance would have appreciated.